At the height of the Cold War, the Eisenhower and Kennedy administrations made removing Fidel Castro's regime one of their highest foreign policy priorities. The Castro Obsession provides new insight into the bold U.S. covert war against Cuba that lasted from 1959 until 1965. 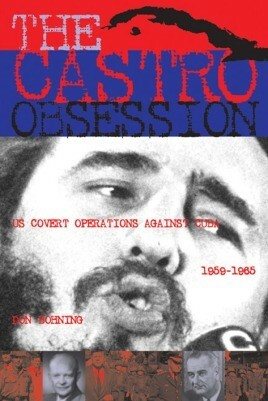 Unfortunately, due to sales rights restrictions, we cannot offer The Castro Obsession for sale in your country. At the height of the Cold War, the Eisenhower and Kennedy administrations made removing Fidel Castro's regime one of their highest foreign policy priorities. The Castro Obsession provides new insight into the bold U.S. covert war against Cuba that lasted from 1959 until 1965. Eisenhower and Kennedy's fervent desire to get rid of Castro led to the failed Bay of Pigs invasion, but the efforts to oust his regime did not end there. It became an obsession. Primarily through the CIA and the military, the United States resorted to economic and political destabilization, propaganda, sabotage, hit-and-run raids, and assassination plots to try to topple the regime. This secret war was one of the most wide-ranging, sustained, expensive, and ultimately futile covert action campaigns in history. Was this secret war wise, and did it ultimately promote U.S. interests? Don Bohning says no. Even if the details were murky, the extreme American pressure on Cuba was apparent to all, and this heavy-handedness severely damaged the U.S. image in Latin America and much of the Third World. Instead of ridding the hemisphere of a dictator, these efforts increased his international political fame and provided him the excuse for more repression in Cuba. U.S. attempts to overthrow Castro also had dire unintended consequences, such as contributing to the Soviet decision to install nuclear missiles in Cuba, which produced the most dangerous crisis of the Cold War. Bohning sheds new light on this covert war, revealing that it was even more extensive, risky, and long-lived than previously thought.